2011 was an action-packed year with the greatest amount of storm rotation I have ever seen in my life in conjunction with the largest amount of storm chasing I have done to date. This page features 16 chase reports covering a wide range of subject matter including geomagnetic storms, huge snow flakes, the biggest gorse fire outbreak in living memory, severe multicell thunderstorms, funnel clouds, NLCs over Dunluce Castle, fireworks over Lough Neagh, the finest moonbows I have ever seen, numerous day and night coastal chases and ending with winter squalls and fierce Atlantic storms. This year brought me that one step closer to catching my dream shot of a tornado over N. Ireland. I hope you enjoy reading these reports as much as I enjoyed living them. On Dec 28th 2011 I had a great chase to the Antrim coast at Ballintoy Harbour with my girlfriend to document a severe Atlantic storm where we experienced 70-80mph wind gusts, massive waves, a surreal high velocity foam blizzard, and a dusk mammatus display during my last storm chase of 2011. A successful, frightening, and thrilling day with car troubles which added to the adventure. One page report with 12 images and 1 youtube highlight slide show video covering a year of sky action. - REPORT. 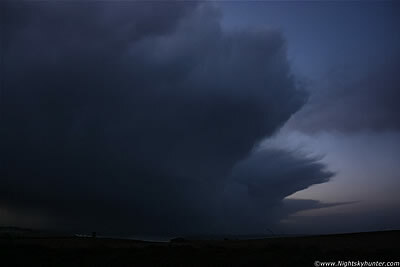 Detailed image report covering three days and nights of storm photography between Dec 4th and 7th 2011. During this period my girlfriend and I intercepted night time convective cells at the Co. Antrim coast, enjoyed a surreal moonlit beach walk with blowing sand like the Sahara Desert and drove through heavy snow storms followed by the first laying snow of the year on Glenshane Pass with moonlit snow images with stars from the same location during the night making for a great period of adventure. One page report with 19 images and 1 video clip. - REPORT. 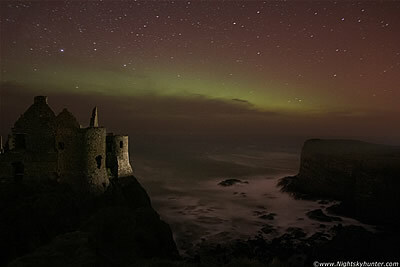 On November 29th/30th I spent a rewarding night at the Co. Antrim coast where I spent over 8 hours chasing. 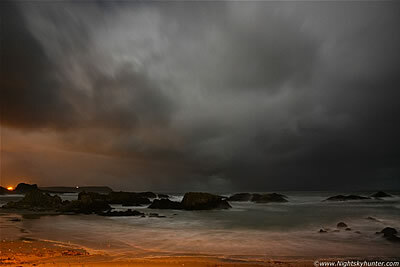 I ended up having a thrilling time at Ballintoy fishing harbour under pristine dark skies where I battled with squalls of rain and sleet, gale force gusts of wind, and enjoyed lightning flashing over the sea from a thunderstorm 30 miles away between the coast and Scotland. This was followed by a starscape-cottage photo shoot and ending with a faint aurora display over the sea which made for an unforgettable night's adventure. One page report with 14 images. - REPORT. October 17th and 18th 2011 produced two days in a row of wild Autumn weather across much of UK and Ireland with tornado potential. On the 17th an active cold front produced a squall line with a LEWP which delivered a tornado over Britain along with a record early snowfall over Glenshane Pass. 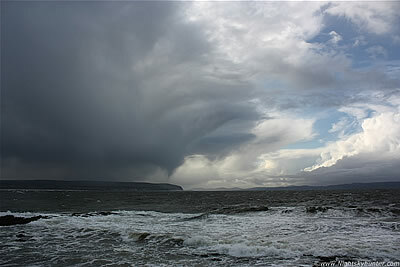 On the 18th I chased coastal storms in nasty conditions with gale force winds and hail showers at the Co. Antrim coast where I captured a suspicious lowering from an ocean cell which may have been a possible funnel cloud or waterspout behind Magilligan Point some 10 miles away from where I was standing. The case is still open but it made for an interesting chase day and further inspiration to get hunting more coastal twisters. One page report with 3 images. - REPORT. Friday Sept 16th was an exciting day after a severe forecast was issued by UKASF for N. Ireland with a threat of strong wind gusts, 2cm hail and tornadoes. 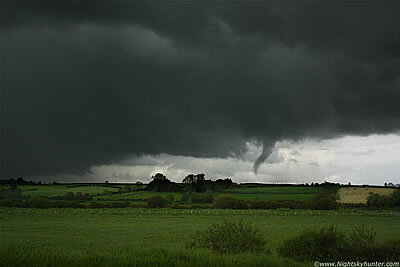 An occluded front produced a tornado over Clogherhead, Co. Louth before midday. By the afternoon I was chasing post-frontal cells in a sheared environment, my 1st chase was a damp squib however I was almost caught off guard later when a large cell moved over my home town of Maghera producing torrential rain and a large rotating wall cloud which produced a very close range funnel accompanied by other regions of rotation and scuddy vortices as the cell passed over homes before vanishing over the countryside making this the closest I have ever got to a tornado touch down. One page report with 11 images. - REPORT. Spectacular night spent in the Maghera countryside hunting for lunar rainbows with the waning full moon in the E and trains of convective showers feeding in from the W which provided the perfect ingredients for their formation. 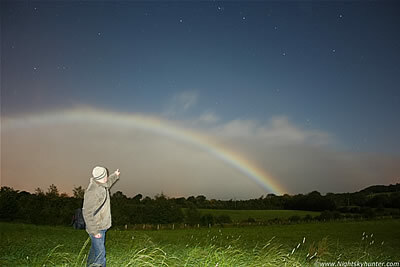 During a 1.5 hour period I observed and photographed 7 sets of moonbows with some of the finest examples I have ever seen to date with vivid colours in the primary bow complimented by secondary arcs and even rare lunar supernumerary arcs making for one of the most satisfying and rewarding moonbow hunts I have ever undertaken. One page report with 16 images. - REPORT. 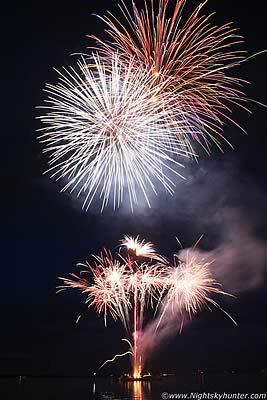 On Friday evening, August 26th 2011, I attended the annual 'Festival of Lights' event at Ballyronan Marina on the NW shore of Lough Neagh with my girlfriend and sister where we enjoyed a thrilling fireworks display. The light show looked visually stunning against a lovely clear blue dusk sky which made for a great atmosphere while a large crowd composed of families and children looked-on as fireworks exploded overhead from a floating launch boat with their brilliant reflections illuminating the calm water below. One page report with 8 images. - REPORT. 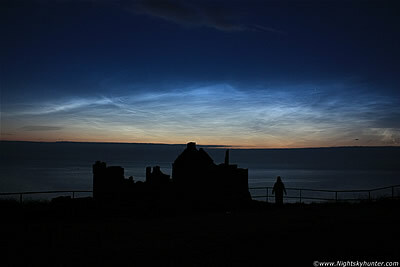 On July 10th 2011 the most spectacular Noctilucent Cloud display of the season appeared during evening twilight and remained visible all through the night as a shadow-casting type 5 display. My girlfriend and I observed and photographed the spectacle from the North Antrim coast outside Portrush where we watched in awe as the electric blue NLCs glowed above the famous 17th century ruins of Dunluce Castle. The NLCs could be seen reflecting on the calm Atlantic Ocean while complex NLC whirls, bands, waves and lacunosus holes moved in real time which made for a surreal Summer's night. 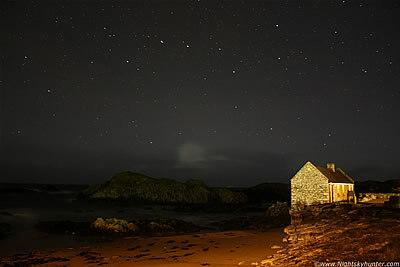 Also included are two images of Runkerry House at dusk. One page report with 14 images. - REPORT. On July 7th 2011 an unstable post frontal airmass associated with an unseasonal deep Atlantic low generated almost 1000 CAPE and LIs of -3 across N. Ireland in conjunction with troughs and convergence zones. The Met Office had a yellow warning issued for flooding and a severe thunderstorm watch was issued online. 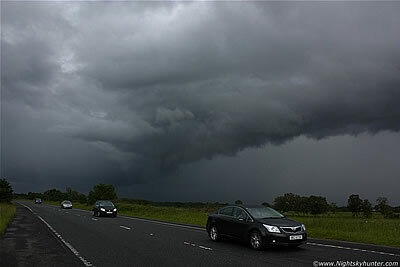 During the afternoon Declan O'Doherty and I intercepted the best storm of the day over the Glenshane Road with a menacing black shelf cloud with c-g lightning which knocked out the power in 40,000 homes across N. Ireland. One page report with 9 images and 1 video clip. - REPORT. July 6th 2011 turned out to be a day of unexpected surprises. After the first half of the day spent chasing around the Atlantic coast in search of funnel clouds and thunderstorms I returned home during the late afternoon with nothing to show for the chase except another wasted fuel payment. 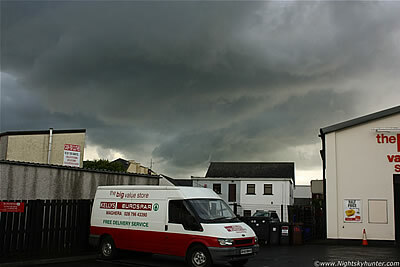 On the way home I spotted several isolated cells over my home town of Maghera and within min's of arriving at my house I spotted the first of four funnel clouds within a 35 min period rotating over the Maghera-Glenshane Pass area associated with sudden multicell storm development which made the day a success. One page report with 8 images. - REPORT. 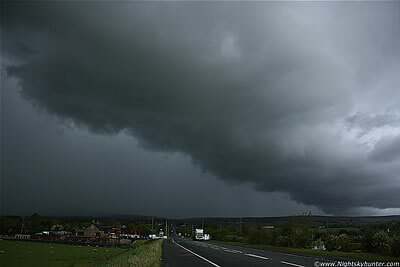 June 7th 2011 was the best chase day of the year when Declan O' Doherty and I intercepted a line of multicell storms over the mid Ulster area in a 900 CAPE environment which interacted with a significant convergence zone which resulted in a rotating updraught base and a beautiful funnel cloud rotating over the lush fields of Knockloughrim not far from the main Glenshane Road. The storm went on to produced several hours of lightning and delivered an intense hail storm which covered the roads like a layer of snow. A thrilling day of high rewards, good storm structure and a vortex which almost touched down as a tornado. One page report with 14 images and 2 video clips. - REPORT. On May 9th 2011 N. Ireland experienced its biggest thunderstorm outbreak in years when trains of multicell storms crossed the country producing hundreds of lightning strikes in a sheared atmosphere with 1000-1200 CAPE and LIs of -4. I intercepted four major thunderstorms, three of which where over the Glenshane Pass where severe multicell storms produced an abundance of pink lightning and spectacular whale's mouth displays. The highlight was severe storm number three which I chased across Glenshane with BBC Newsline weather presenter Jackie McCann which produced regular lightning and a HP core with the worst hail downpour I have ever encountered. Unforgettable action-packed day for so early in the season. One page report with 20 images and 3 video clips. - REPORT. On April 26th 2011 one hundred gorse fires broke out over N. Ireland with the largest on Glenshane Pass which lasted for hours spanning 4km in length. Sixty fire fighters from six different stations battled with the blaze on a hot afternoon and finally subdued the fire into submission. 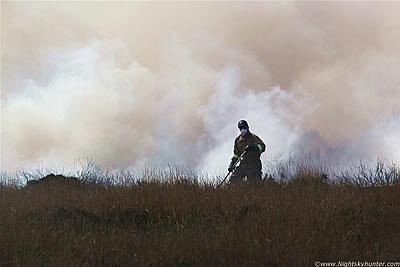 The scene was dramatic, exciting, and concerning, especially so since this major gorse fire was started deliberately. The 2011 gorse fire season has been the worst in living memory with a record breaking number of fires and emergency calls to fire crews. One page report with 15 images and one video clip. - REPORT. 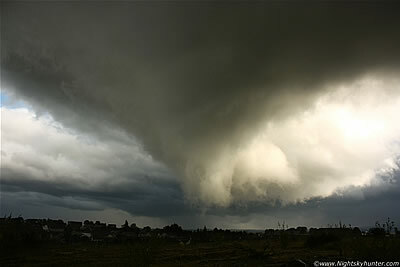 Image report documenting the first inland thunderstorms of the 2011 season when numerous cells formed across the country during the afternoon hours. The main event was the multicell storm over N. Ireland extending for tens of miles from Maghera to the N coast with strong precip cores and periodic c-g lightning. The storm knocked out the power, triggered car alarms, and exhibited rapid rotation under the flanking area. The highlight was the view of the huge anvil against a rich blue sky. This was a fun local chase with Conor McDonald and Declan O'Doherty. One page report with 8 images and 1 video clip. - REPORT. 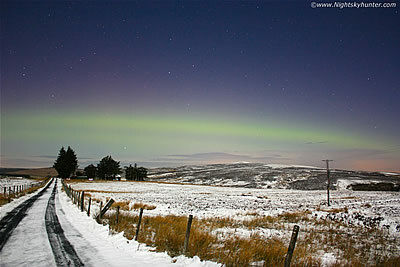 Feb 14th 2011 was an eventful day which produced two exciting transient events. 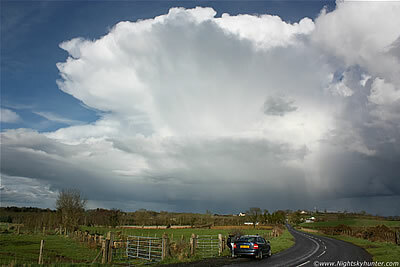 The first was an afternoon snow shower over Maghera which dropped snow flakes the size of tennis balls! then after dark a CME associated with an M6.6 M-class flare from AR1158 produced a beautiful aurora display which I watched from the Glenshane Pass with Conor McDonald and Declan O'Doherty. The view of the green aurora with bright moonlit snow below was a real treat making this the first significant mid latitude aurora display of 2011. One page report with 6 images and 1 video clip - REPORT. 2011-2014 storm chasing highlights featuring raw footage and numerous time lapse segments of storms across both Ireland and N. Ireland filmed with three different cameras from old to new, also of note is a section where I was storm chasing with BBC Newsline weather presenter Jackie McCann and the Glenshane Rd funnel cloud then ending with a stunning sunrise from the Antrim coast, Best watched at 1080p, soundtrack is from 'Inception'.